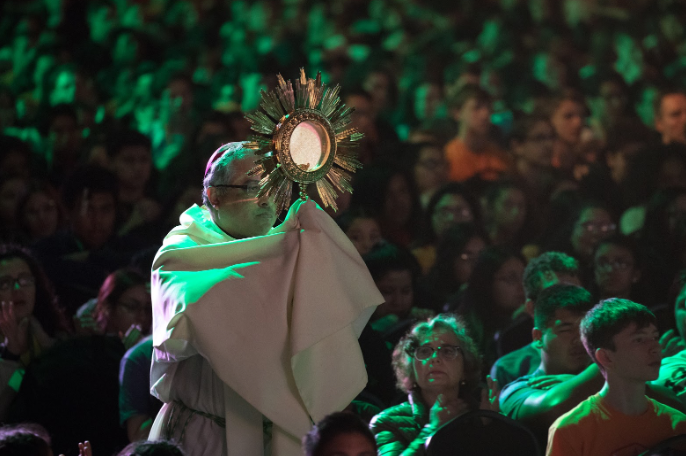 To celebrate the faith of young people within the church, the Diocese of Austin hosts the Diocesan Catholic Youth Conference (DCYC) every year. This year, they celebrated 60 years of the conference and the TSV team was excited to help them express their “Fully Alive” theme with full-service production. The production for this event has slowly evolved since Technical Director, Jason Guenther, started in 2010. 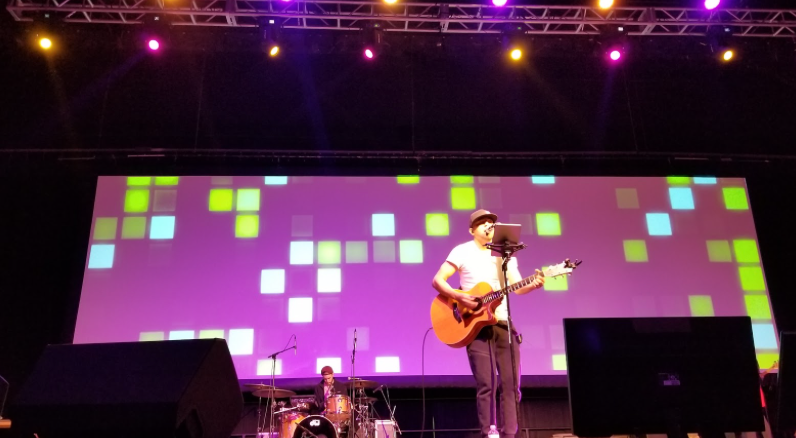 “At that time the production volunteers were renting speakers on sticks from Rock N Roll Rentals, using a conference room projector for lyrics and had a few lights on tripods for this event,” he explained. “Not as many kids were present, but they were doing this event in the same space as we are today with that equipment,” he added. 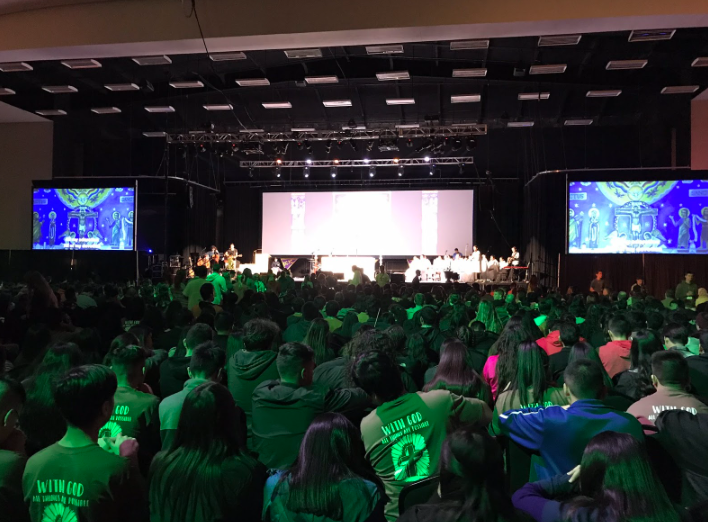 With DCYC’s desire to uplevel the event and an expected number of over 2,500 attendees in mind, TSV worked to deliver a full-service production that would resonate with a specific audience of religious youth, while also staying true to the theme. 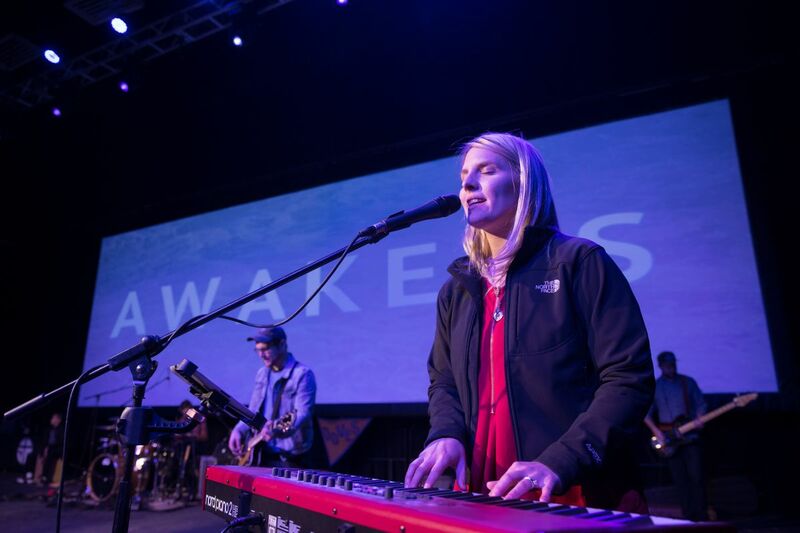 With the band, mass, keynotes and performances happening on stage, the centerpiece of the production was a 12’ x 40’ backdrop screen. “The video backdrop really helped to provide a lot more pop to the stage,” said Guenther. We filled out the look with two 11’3” x 20’ Stumpfl rear projection screens on both sides of the main screen. To display visuals, presentations and branding on the backdrop screen we used two high-definition laser projectors and Epson 15,000 lumen laser projectors for the side screens. Live video was shown using a four-camera video shoot with separate outputs going to each projection screen. The end result was a bright and full display that drew all of the audience’s attention to whatever was happening on stage and ensured that each person could see it clearly. The audio support for the band included 10 in-ear monitors with a pair of Avid Venue SC48 mixers for FOH and monitor positions. The lighting in the room created the perfect ambiance and helped brand the event with the specific colors of the conference. We used a full lighting rig with eight sharpies, four profiles and six MAC Auras. 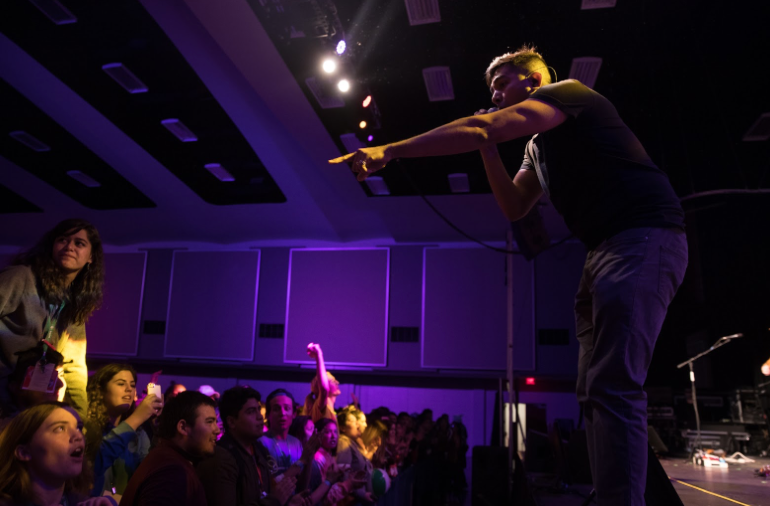 A flown truss gave us the ability to add moving lights above the stage and LED fixtures allowed us to wash the entire room and crowd to set the mood at any given time, whether mass was going on or the band was performing. 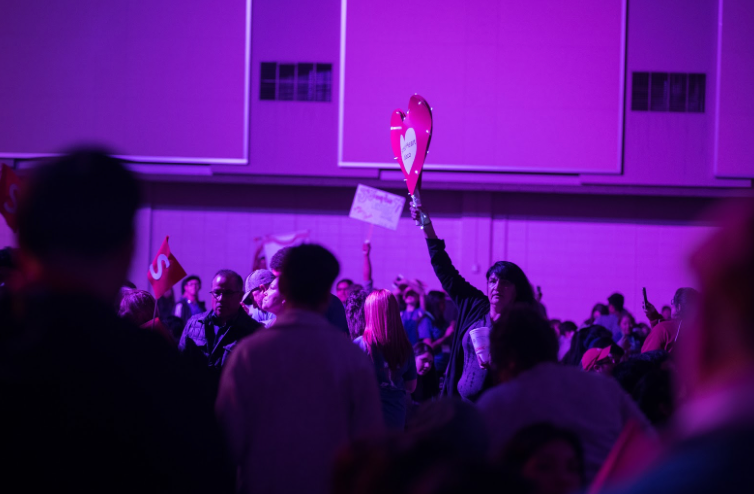 The colorful lighting and captivating visuals shown on the projection screens helped communicate the theme to the attendee’s and kept them intrigued each day of the conference. 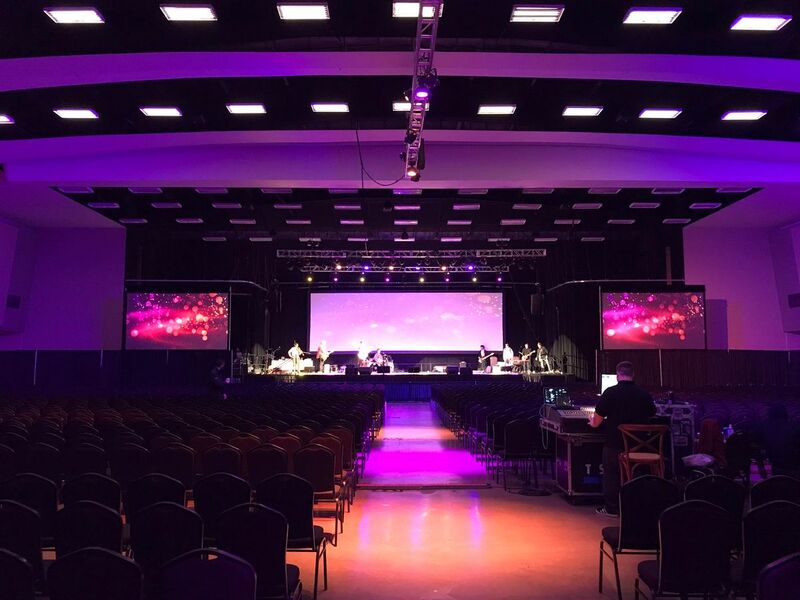 With the other elements of the production, the event came together successfully and our team was able to provide a seamless service that resulted in a fun conference and a satisfied client. “It has been so nice to have a single company come in and handle everything...the TSV crew was very flexible to meet our last minute needs and did a great job guiding us through the changes,” Guenther concluded. Here are some awesome pictures from the conference, check them out!